The Emergency Aid Staged Activity Badge can be achieved from Stage One through to Stage Five. If you already hold a first aid award such as the British Red Cross or St. Johns Ambulance, covering a similar syllabus, you can automatically achieve Stage Two of the Emergency Aid Staged Activity Badge with these awards. If you already hold a first aid award such as the British Red Cross or St. Johns Ambulance, covering a similar syllabus, you can automatically achieve Stage Three of the Emergency Aid Staged Activity Badge with these awards. 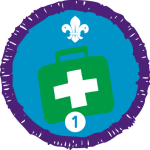 If you already hold a first aid award such as the British Red Cross or St. Johns Ambulance, covering a similar syllabus, you can automatically achieve Stage Four of the Emergency Aid Staged Activity Badge with these awards. You must attend formal training to gain Stage Four of the Emergency Aid Staged Activity Badge. The training must be delivered by somebody who is a qualified first aid provider. Emergency Aid Stage Four may be used as an alternative to completing Module K, First Aid Master Class, of the Young Leader (YL) programme. If you already hold a first aid award such as the British Red Cross or St. Johns Ambulance, covering a similar syllabus, you can automatically achieve Stage Five of the Emergency Aid Staged Activity Badge with these awards.